Some people report undergoing an experience very similar to a terrified falling into a burning "pit of hell" at the start of anesthesia. This is no fantasy. During a long career in anesthesiology, I have heard this story from two persons. The anesthesiologist injects a white milky substance into a vein on an arm to start anesthesia. The person feels burning pain in their arm, like it is on fire. A few seconds later a black hole appears before their anxious eyes and grows rapidly. Suddenly, overwhelmed by terror, they feel themselves falling into this black hole, to be enveloped by total darkness as they plunge into a burning blackness just before losing consciousness. After awakening from the anesthetic, the person remembers these things, and tells the anesthesiologist of their experience. They ask, "Is this a near death experience? did I really fall into the burning pit of hell?" Such experiences are no fantasy. Some people report undergoing just such experiences as an injected anesthetic drug begins to work. Are these experiences itrue near death experiences? Are they true visions of a burning pit of hell as described in the Bible and Koran? For example the Bible tells us of the pit in several passages such as this one. Actually this seemingly wondrous, hellish experience, is explained by the functioning of the body during the start of anesthesia. At the start of all modern general anesthesia, a dose of a sleeping drug is injected into a vein. The drug most commonly used these days is called Propofol, and most adults fall asleep 20 to 30 seconds after a sufficient dose is injected into a vein. Unfortunately Propofol is very irritating and causes a burning pain in the arms of many people when injected. This is the burning pain described by many people as they fall asleep. Furthermore, it is a common observation of many anesthesiologists that anxious people often become even more anxious or restless just before falling asleep. This is the terrified feeling experienced by many people as the general anesthetic begins to work. Propofol is injected into a vein over a period of about 10 to 20 seconds. It mixes with the blood flowing in the veins, and is transported in blood pumped by the heart into the head, where it diffuses out of the blood capillaries into the tissues of the head. This is not an instantaneous process. It takes about 20 to 30 seconds for a person to fall asleep after Propofol, or other similar drugs, are injected into a vein. Now the most important parts of the head as regards conscious sensation are the brain, ears, and eyes. Not all sense organs, and not all parts of the brain are affected equally or at the same time by sleep inducing drugs such as Propofol. Those parts of the brain generating consciousness are less sensitive to Propofol than are the eyes and the rest of the brain. So just before falling asleep, a person first experiences the effects of Propofol on those more sensitive parts of the brain and sense organs. To begin with, diffusion of Propofol into those parts of the brain controlling muscle tension causes all muscles and muscle spindles to suddenly relax, and affected people suddenly feel themselves falling. This is the same mechanism generating the sensation of falling that people sometimes experience just before falling asleep while in that stage between awake and sleep. At the same time, blood containing Propofol flows into the blood vessels of the eyes. The light sensitive part of the eye is called the retina, which is a thin membrane packed full of cells reacting to light coating the back of each eye. All these nerves and light sensitive cells need blood to provide them with oxygen and nutrients, as well as to remove waste products of cell function. 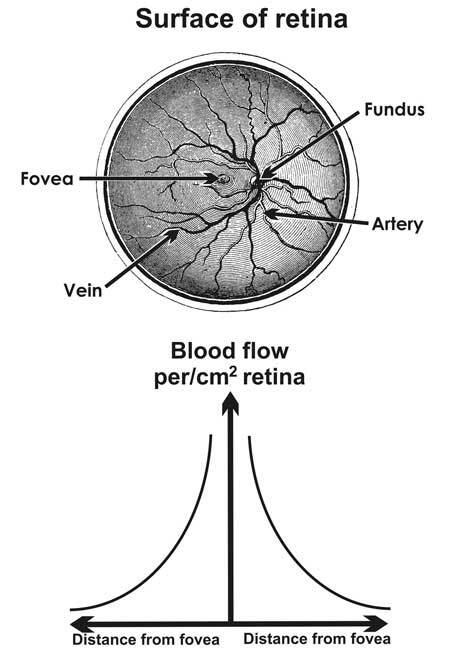 Now the flow of blood to the retina is maximal at the fovea in the centre of the retina, and declines rapidly towards the edge of the retina (Alm 1973). 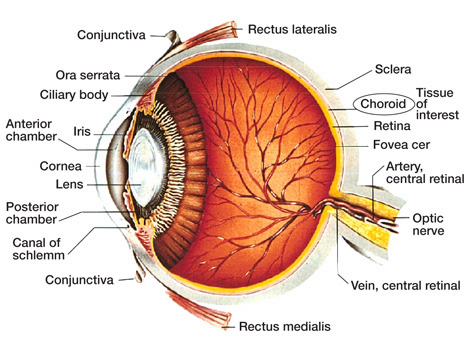 So as the Propofol enters the blood vessels of the eye, the highest Propofol concentrations are initially in the tissues of the central region of the retina, which means that the central region of the retina is the first part of the retina to malfunction, followed soon afterwards by the whole retina. So a person receiving Propofol, or any other similar drug, will first notice a central dark spot, followed a few seconds later by total darkness. This is the darkness of the opening of the pit - and this is the total darkness of the black pit of hell into which these people feel themselves falling just before the concentration of Propofol in those parts of her brain generating consciousness finally become high enough to cause loss of consciousness. Some people may remember these sensations and emotions upon awakening from general anesthesia, and combine them into a coherent total experience of a terrified person falling into a black and burning pit of hell. No supernatural explanations are needed to explain this seemingly wondrous experience, just some knowledge about the functioning of the body. Interested readers can read a more popular account in chapter 10 of the book The Unholy Legacy of Abraham.